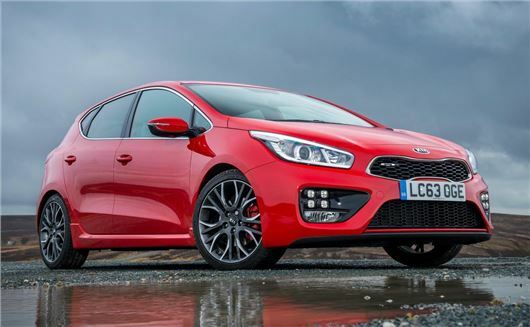 Kia has launched a five-door version of its Cee’d GT, joining the three-door Pro Cee’d GT introduced in 2013. It uses a 1.6-litre turbocharged petrol engine producing 204PS and 265Nm of torque and is offered in two trim levels, with prices starting at £20,495. Regardless of trim level, 0-62mph takes 7.4 seconds and top speed is 143mph. Emissions are 171g/km and official economy is 38.2mpg. The styling is similar to that of the three-door with quad daytime running lights, deeper bumpers and alloy wheels. Inside there’s Alcantara and leather upholstery, along with Recaro seats. Entry level models come well equipped, with 18-inch wheels, air conditioning, cruise control, automatic lights, reversing sensors, Bluetooth and a TFT display. Moving up to GT Tech trim, priced at £22,995, adds a larger screen with navigation, dual-zone climate, automatic wiper and xenon headlights. Order books are open and buyers will get the same seven-year 100,000 mile warranty that's offered across all Kia models. Additionally, Kia is offering an all-inclusive servicing and maintenance package to retail buyers, covering services for three or five years.